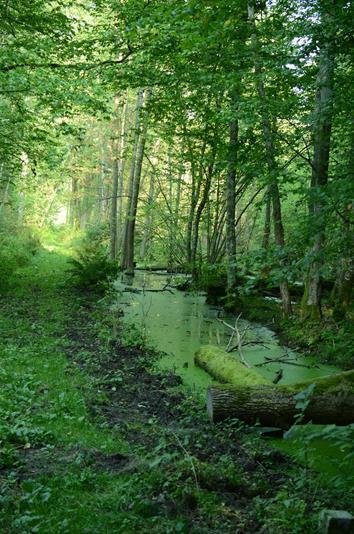 In Białowieża Forest the last remains of primary forests of the European lowlands were preserved. Due to several centuries of protection and extensive management, numerous species of organisms, already extinct everywhere else, survived here. In this forest complex, many commonly known species, especially trees, take forms and sizes not found anywhere else. Characteristic features of primary forests are particularly visible in the area strictly protected from the very beginning of the Park existence, between the rivers Hwoźna and Narewka. Protection of Białowieża Forest, and especially of Białowieża National Park in the 20th century, supported survival of not only individual species, but also of their complexes and of a natural spatial layout of plant communities. Forests predominate in the Park landscape, covering about 95% of its area. The remaining part is covered by fields, meadows, roads, wastelands, and standing and flowing waters. The predominating forest type in the Park is a broadleaved forest – mixed deciduous forests, with alder-ash riparian forests and alder swamps in river valleys and drainless hollows. The poorest habitats are covered by pine forests and by spruce and pine mixed forests. 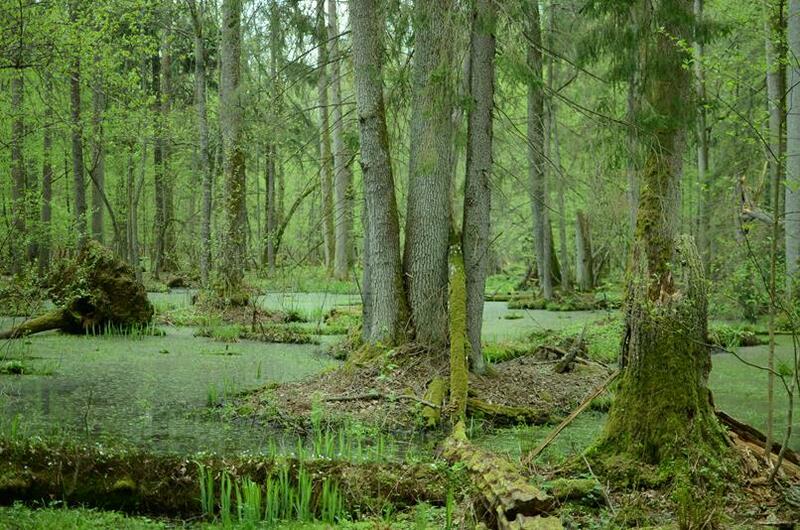 Wet peatbogs are covered by swamp birch forests, swamp spruce forests, and swamp pine forests. 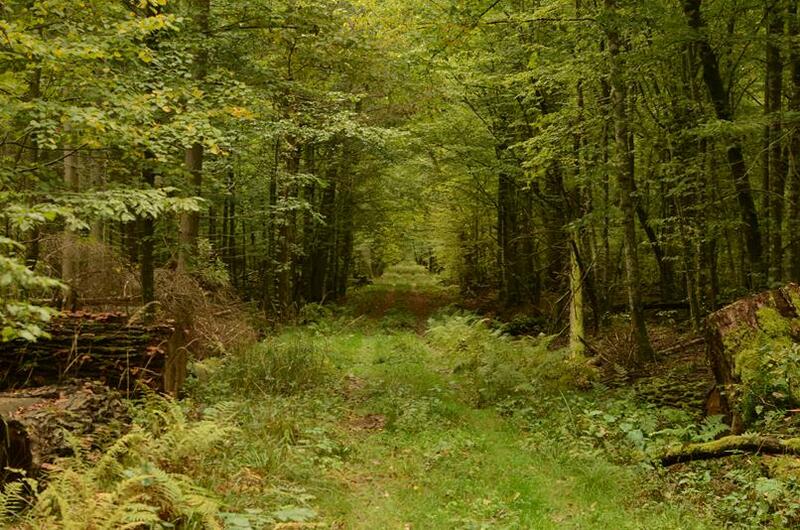 The habitats are often of a transient nature, and natural processes, undisturbed by human interferences, lead to visible changes in ecosystem dynamics and in a share of individual species in forest complexes. The number of animal species recorded in the Park exceeds 10.5 thousand. Invertebrates are most numerous group, although the best known group of animals, both in the Park, and in Białowieża Forest, are mammals. Thanks to historical sources we know that some mammal species became extinct both in the Forest and in the world. They included the tarpan and the aurochs, unfortunately, we do not have clear evidence that those species were naturally present in the Forest. In case of other species, such as the European mink and the wildcat, their area of natural presence shrank and currently does not cover the Forest, or even Poland (information about presence of the wolverine and the sable in this region in the historical times is unreliable) Due to human activities the ecological niche vacated by those species was filled by other species: the raccoon dog, the American mink or the muskrat. In the Park, and thus in the Forest, the contemporary mammalian fauna is represented by 59 species, from 6 orders: Eulipotyphla (mole, hedgehog, shrews and water shrews), bats, carnivores (wolf, lynx, fox, raccoon dog, badger, otter and other Mustelids), even-toed ungulates – Artiodactyla (bison, moose, red deer, roe deer and wild boar), rodents – Rodentia (dipodids, murids, Arvicolinae, and Gliridae), and lagomorphs – Lagomorpha (European hare and mountain hare). The symbol of the Park is the largest European mammal, the bison. Birds, represented by over 250 species, are the most numerous group of vertebrates in the Park. About 2/3 of them nests here. When compared to other Polish and European forest areas, Białowieża Forest is characterised by exceptionally rich and diversified avifauna. The following groups are particularly numerous: diurnal birds of prey – 15 species, including western marsh harrier, red kite, and lesser spotted eagle; owls – 8 species, including pygmy owl and boreal owl; woodpeckers – 9 species, including white-backed woodpecker and three-toed woodpecker; and Sylviidae, including wood warbler, collared flycatcher, and reed warbler. Furthermore, several species of amphibians, 7 species of reptiles and 23 species of fish can be found in the Park. The most numerous group of animals are invertebrates, with the most abundant and variable division of insects, containing over 9000 species. Amongst the Park plants the vascular plants, with nearly 800 species, are the most numerous group. 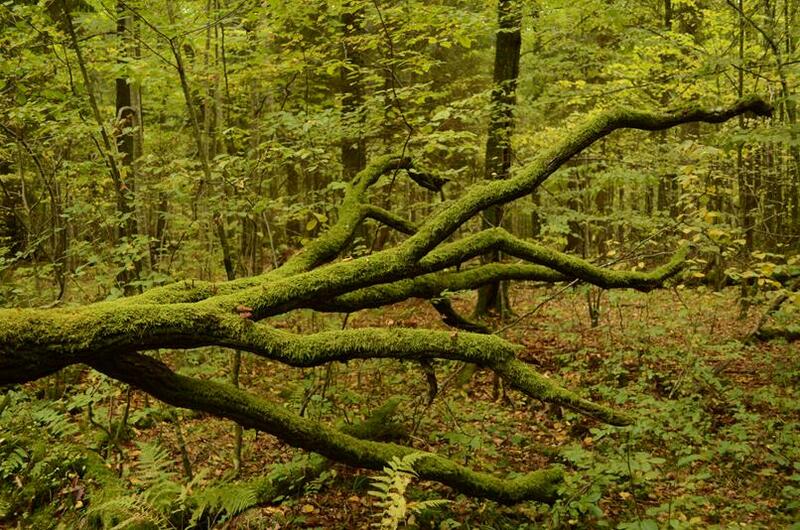 They represent 2/3 of the Forest flora and nearly 1/4 of flora of Poland. As there are no geographical barriers, the Park flora does not differ significantly from that of the region. It does not contain endemic species, although some relic species can be found, remnants of different climate conditions prevailing here in the past. Relics of the colder period include swamp willow, marsh saxifrage, or felwort. Presence of species such as sand ryegrass or common ivy, on the other hand, indicate that in the past the climate in the Forest was milder. 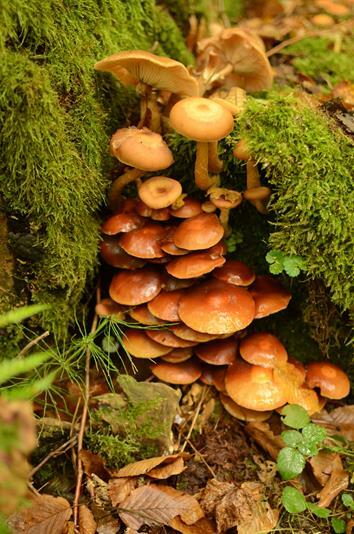 So far, over 1600 species of macrofungi were noted, although it is estimated that their actual number is much larger. 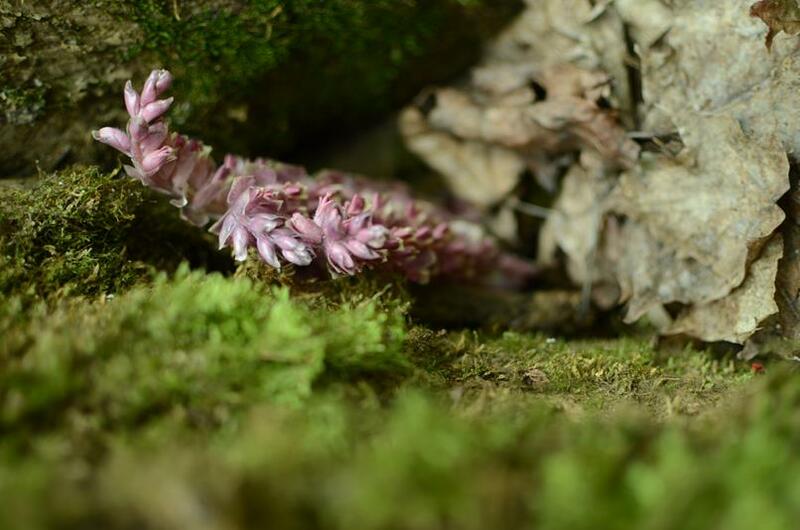 However, this confirmed list of species recorded on the area of just 10 thousand ha represents 25 % of the mycobiota of the whole European continent. Recently, many sites of valuable species have disappeared all over the world, mainly due to the adverse influence of human activities on natural ecosystems. The biota of lichens, that is, lichenous fungi, consists of 237 species noted within the Park, and representing about 60 % of all species found in the whole Białowieża Forest. 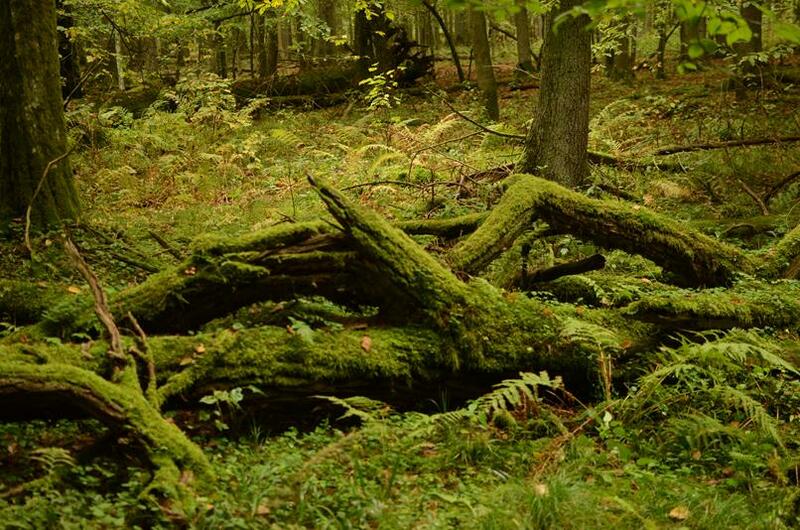 Many species of bryophytes, lichens and fungi, which were probably wide-spread in the past, survived to the 21st century only in ecosystems such as Białowieża Forest. 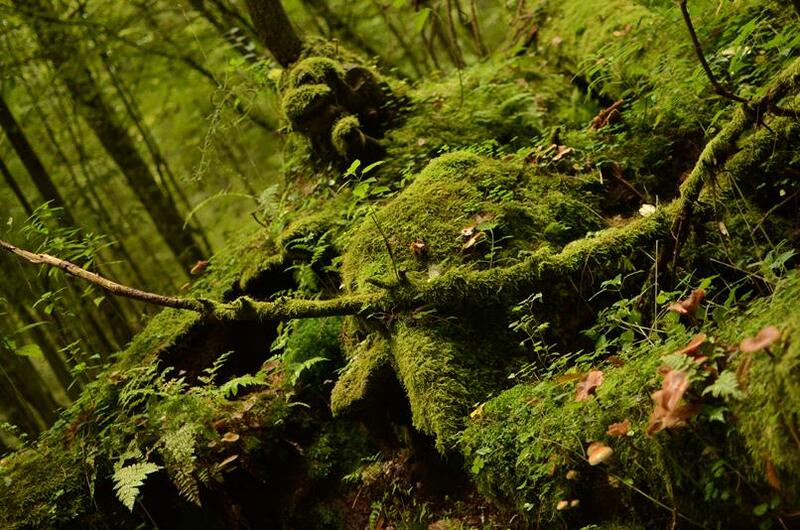 They can still be found where the natural character of the forest was maintained, and natural conditions combined with sustainable human activities facilitated their survival. Majority of those rare and endangered species live on dead wood or on boles, branches and bark of old trees. And it is the presence of those components that make Białowieża National Park so unique, while at the same time, it is a measure of the extent to which the natural processes and primary nature of this forest complex were maintained.